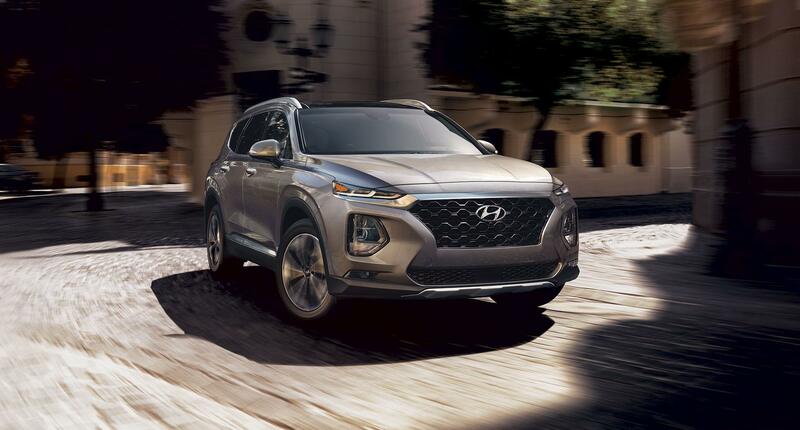 If you haven’t heard, the 2019 Hyundai Santa Fe launches an all-new generation of this legendary crossover. It features a new look, innovative features, and all the excitement you’d expect from a Hyundai. To test drive the all-new Hyundai Santa Fe, look no further than your local Hyundai dealership, Mississauga Hyundai. Of course, the first thing everyone will notice about the 2019 Hyundai Santa Fe is the all-new exterior design. While you’ve seen it online, when you come in for a test drive, prepare to be wowed in person at its dramatic appearance. Up front is a cascading grille that’s both bold and sophisticated. Ultra-modern twin headlamps that are fully LED also make a strong statement, plus help greatly with visibility in a range of conditions. Standard alloy wheels and a well-defined side profile help further. Even the roof looks trim and impressive. Hyundai also keeps the crossover utilitarian by design. Standard roof rack side rails allow you to carry larger items up top. On the inside, the rear seats can recline back, so passengers easily get comfortable. A 60/40 split means folding down part of the backseat to accommodate large cargo items is simple and easy. You’ll never feel like the new Hyundai Santa Fe can’t handle what you need. From the moment you first slide behind the wheel for a test drive, you’ll feel confident in this crossover and its capable performance. Two engines are available for the Hyundai Santa Fe. The 2.4-litre Gasoline Direct Injection engine runs especially efficient. A peak 185 horsepower and 178 lb.-ft. of torque will keep you happy. The engine works with a completely new 8-speed automatic transmission that shifts smooth. If you want even more sportiness, try the 2.0-litre turbocharged GDI engine, which also works with an 8-speed automatic transmission. It puts 235 horsepower and 260 lb.-ft. of torque in your control, so hitting a nice cruising speed is effortless. When you take the 2019 Hyundai Santa Fe out on the road, don’t forget to check out the many practical and convenience-oriented features. They really make this crossover a joy to own and use every day. For example, the available smart power liftgate opens automatically when you step within 3 feet of the vehicle’s back. That means no needing to wave your foot under the rear bumper or anything like that. A high-adjustable function means you can set the tailgate to stop before it reaches a certain height and causes damage. Adding the optional proximity key means no having to dig the key out of your pocket or purse as you walk up to the Hyundai Santa Fe. Instead, the vehicle will sense your presence, turning on welcome lights. The push-button ignition also works without inserting the key anywhere. No matter the weather outside, the available dual-zone automatic climate control system keeps you and your front passenger comfortable. You each get to set whatever temperature you like. The system also has an auto-defogging windshield function, which is a nice plus. The best way to really get to know the all-new 2019 Hyundai Santa Fe is by taking one for a test drive. Contact Mississauga Hyundai today for an appointment.